Notes: Average depth was 13.4 m. This dive completed my first full 24 hours under water! It only took 6 years. Well the next 24 will come a lot quicker. I was glad to have the camera as well. Equipment: All own gear. Rented tank. Integrated 18lb weight. New Cressi Gorilla bag to carry the gear. Not so comfortable for carrying by hand, but very good on the boat and in the car. Notes: Water was 21 degrees celsius. Average depth was 14.0 m. We (Eithne, Fiona, Declan and I) booked on for a double dive with pro dive manly. We were picked up at the Rose Bay ferry wharf at 7.45 am. Damn early. The boat didn’t go to the planned dive sites because of the conditions at sea. Instead, we went to the Manly Bommie first and then Blue fish point. Really nice dives. Surprisingly pleasant. 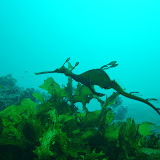 Weedy sea dragons and cuttlefish lining up to pose. Fish doing their fishy things in abundance. An eel under a rock. Eyed by a grouper. Good vis as well. Photos in the Dive #42 entry.